Would you like to live in a tree house?! 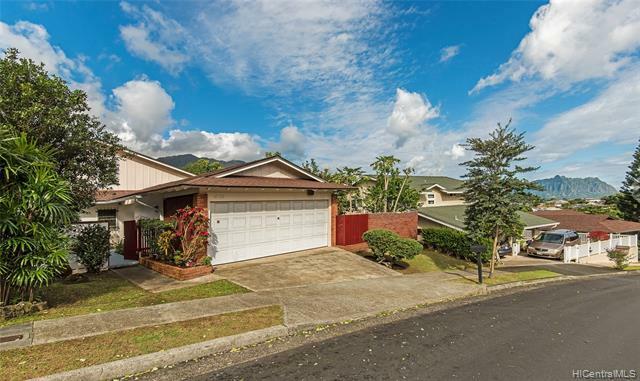 Charming 3Bed/2Bath house in the Ahuimanu Club View Estate neighborhood. Wake up every morning to beautiful sounds of birds and calming views of the Koolau Range. 1st floor has a Living Room with high floor vaulted ceilings and 2 guest bedrooms with 1 full bath. 2nd floor is Master Bedroom with his/her sink, shower and Japanese style furo tub brought from Japan. Approx. 540 SqFt spacious patio deck wrapping around the 1st floor Living Room looking out to lush and mature Java Plum and Guava tree. Enclosed 2 car garage, and fruitful tangerine tree in the courtyard.